Diana Vasilescu is a lawyer practicing in the area of family law at her own law practice in Toronto. She has lived in Montreal and Calgary, and moved to Toronto in 2017. She is originally from Romania, where she was born and raised until the age of 16. In addition to English, Diana speaks Romanian, French and Spanish. Her interests include traveling, languages and experiencing different cultures. Giri Chittur is a Software Sales Professional at Oracle focusing on customer experience solutions. He is a management graduate from Excelsior College, New York. Giri comes from a Rotary family and he was an active Rotaractor in Bangalore, India. He started as a member of the Rotaract Club of Bangalore, and went on to serve as President of the club in 2006-07. He then became the District Rotaract Representative of RI District 3190, India in 2010-11. He was also the Regional Director of the Rotaract South Asia MDIO in 2011-12. As a Rotaractor, he has organized many pulse polio drives, health camps, drives relating to environmental issues, leadership development programs in Government Schools in India and inter-district youth exchange programs with other Rotaract Districts across the globe. Giri and his wife, Roshni, moved to Toronto in November 2017 from India and are excited to begin this new adventure in Canada. Giri loves to travel and has visited several countries across Asia and North America. He enjoys meeting new people and learning about their cultures and cuisines. A true foodie, of late, he has also started popularizing the various cuisines that he gets to sample at restaurants across the city on Instagram. 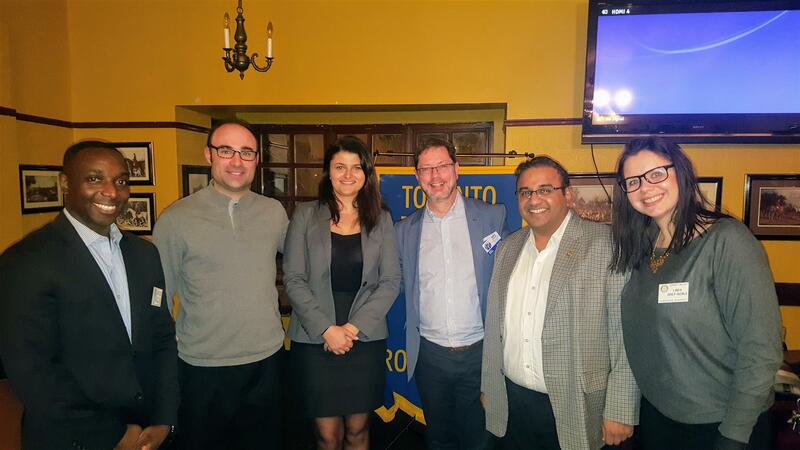 Both Diana and Giri are going to be great assets to TTRC and Rotary and it is our please to welcome them to the Club!